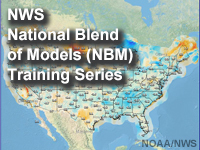 The National Weather Service National Blend of global Models (NBM) Training Series provides information about the models, statistics, verification methods, and other details relevant to the Blend. The first lessons in this training series were produced in 2015 and 2016 in conjunction with the release of the first operational version (v1.0) of the Blend. The intended audience for the training includes NWS forecasters and others using numerical weather prediction products. The material requires some experience with numerical weather prediction and statistics, but advanced users of NWS forecast products might find the material useful. The course begins with an introduction to the NBM, or Blend, and offers details about the motivation for adopting the Blend for use nationally. Other lessons offer information about the gridded output produced, as well as an overview of the statistical methods and verification methods used in the Blend. To receive a course completion certificate, you must successfully complete the four core lessons. These lessons total about two hours of learner contact time. The NWS National Blend of global Models Training Series provides forecasters and other users of numerical weather prediction products with information about the National Blend of global Models (NBM or Blend) implemented in 2016. The lessons offer an overview of the models, statistics, and verification methods used in the Blend. For some of the lessons, particularly those focused on statistical methods and on verification, some background in numerical weather prediction and statistics will be useful. After completion of this course, learners will have more detailed knowledge about the National Blend of global Models and its products and methodology. Describe the motivation for creating the Blend products. List key ways in which the Blend products differ from other available numerical guidance. Describe how Blend data are delivered, accessed, and integrated into the forecast process. List the different products used in the Blend and describe the model type, resolution, assimilation scheme, and number of daily cycles for each model. Explain how the model guidance is interpolated to the grid level. Describe the role of URMA and MAE in the Blend. Describe the downscaling methodologies used in the Blend to calculate temperature, wind, sky cover, terrain adjustments, and other parameters. Describe model biases and the effects of weighting methodologies on the products used in the Blend. List the characteristics of RTMA/URMA and MatchObsAll analyses and describe why RTMA/URMA is used for the Blend. List the characteristics and derivation of single event, grid-to-observations, and grid-to-grid verification. Interpret the product verification for the Blend.